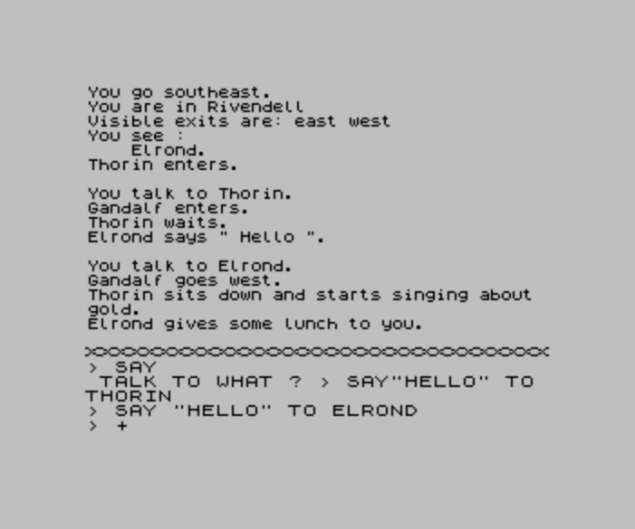 In the last year of a Bachelor’s degree in Science at Melbourne University in 1981, Phil and I were hired by Fred Milgrom as part-time programmers to write “the best adventure game ever”. 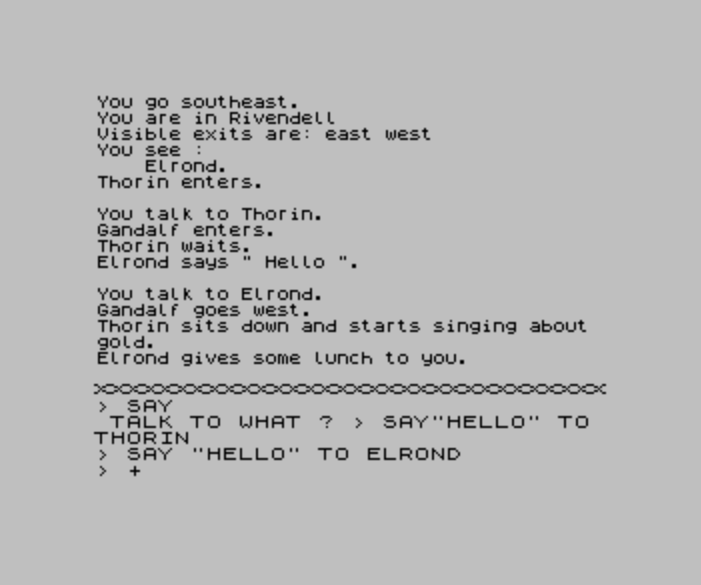 Based on the game’s commercial success and feedback from fandom still rolling in three decades later, we succeeded in doing so: possibly the best-selling text adventure of all time. 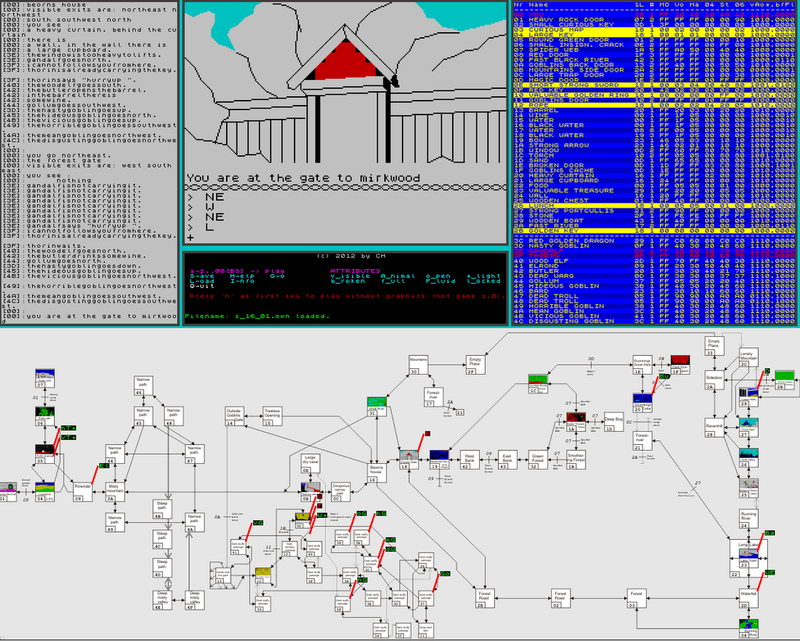 Phil designed and developed the parser that became known as Inglish; I designed and developed the game and the physics engine, the non-player characters and the game puzzles. And then years – decades – passed. I don’t remember when I first started getting fan emails about “The Hobbit“, and began to realize the impact it had on so many people’s lives. It was well into the Internet era. One of the first to find me was from an Italian adventure fansite, “L’Avventura é l’avventura”. He tracked me down at IBM after what he described as a long, long search and sent me some interview questions. I think that’s when I first started realizing that the game had been a huge hit. I’ve had numerous people tell me that it literally changed the course of their lives. 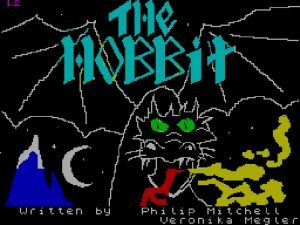 People write to me to tell me The Hobbit drew them away from shooter games, caused them to start reading books, and got them interested in puzzle solving and even in relationships. (It’s truly scary to think of relationships with The Hobbit’s limited characters as a personal growth experience in relationship building.) Some of these players have become software developers, and a number tell me they developed games of their own that tried to recapture some aspect of the game. Winterdrake, in a long post describing the life-changing impact The Hobbit had on him, credits the game for ““forcing” me to change my mind away from my initial impression of the game, it made me shake off some common prejudices, such as “if I don’t understand it instantly, then it can’t be good or interesting” — something most people sadly continue to believe, even as adults. 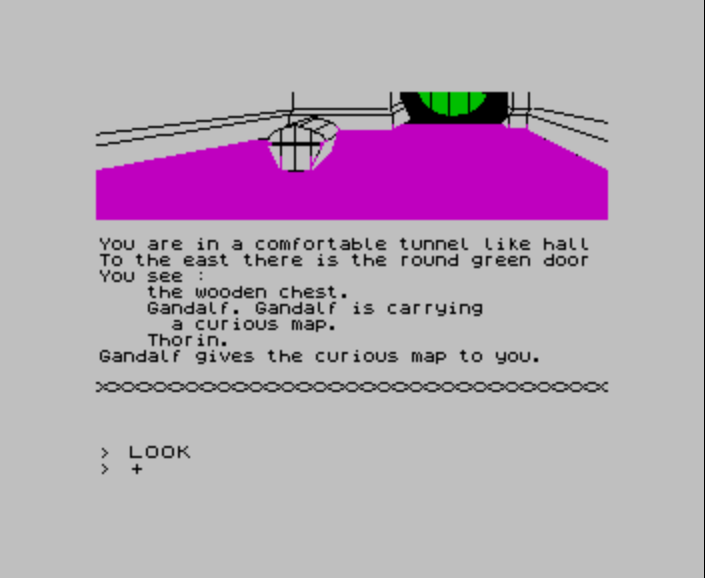 This is one of the most important lessons I ever learned in my entire life.” He also credits the game with moving him from a reading level of Enid Blyton (in Portuguese) to reading The Lord of the Rings. While most people who contact me focus on the characters, the puzzles and the game play, the parser also impacted lives. A recent PhD from Finland wrote to me as he graduated, telling me he’d developed his interest in his doctoral research topic of linguistic methods as a result of his exposure to Inglish. I’ve had folk from various non-English speaking countries (Spain, Mexico, Portugal, Finland) contact me to tell me it inspired them to learn English, although I’ve also seen versions with the text messages in their native languages. Apparently knock-offs were even available in countries like Romania. I still have no idea how many languages or countries boast their own version. Even the bugs affected people’s lives. One fan wrote asking for the meaning of a message he got when he removed the floppy disk from the machine while playing the game, corrupting and ruining the disk. He told me he had only recently, after 30 years, admitted to himself and his friend that he had ruined the game. He was deeply unsatisfied with my response that the message was an error and not an intentional part of the game. 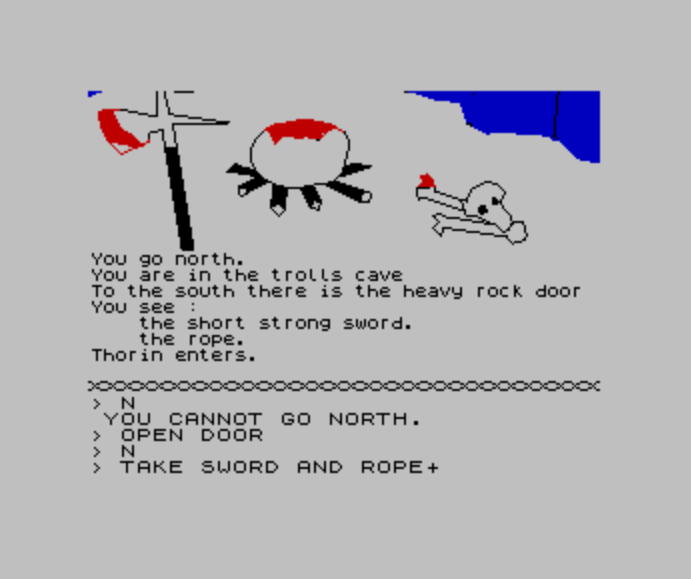 Another fan – a PhD – made multiple attempts over a 30 year elapsed time to reverse engineer the game from the machine code because of a bug: when trying to go east from the ‘Mountains’ he received the message “This room is too full for you to enter”, starting him on a whole new life journey and resulted in Wilderland. He built an interface that shows the game map and the characters’ locations and actions as they play the game – a toolset that would have been invaluable for us to have had for testing. His eventual conclusion to the inspiration for his journey is that the room was a left-over artefact from testing. He says: “When I played the game way back in the 80s, it was the rich physics of the game which fascinated me.” I find it ironic that he may have spent as much time deconstructing the game as I spent constructing it. In fact, writing The Hobbit has had no discernable impact on my own life. At the end of my Bachelor’s degree IBM hired me through their campus hiring program. I started at the same level as other graduates with a Bachelor’s degree and no experience with computers or programming; developing a game in Assembler was not considered to be relevant work experience. The one time I mentioned having written The Hobbit to someone I met in a social setting, the person told me to “admit it was a really bad game.” After that, I did not mention it again. 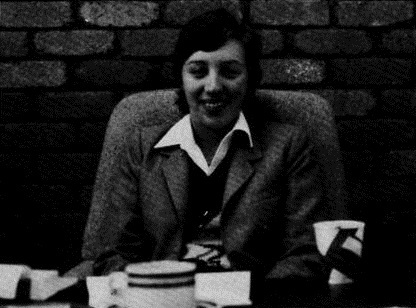 I’ve been asked what it was like to be present at the birth of the Australian game industry. I remember once reading about Kurt Cobain’s being asked what it was like being present at the birth of grunge. He replied that they were just some guys jamming in a basement because they couldn’t find anywhere else to play. My answer is pretty similar; I was just a university student with a somewhat cooler part-time job than the others I’d been able to find. There was no games industry to be part of, and no concept that we were part of creating one. There’s also something about having one’s work be part of a museum retrospective, an event one normally associates with dead people, that provokes mixed feelings (Australian Center for Moving Image (ACMI) featured The Hobbit in Hits of the 80s, in 2006). It’s even part of the Internet Archive’s Historical Software Collection, so the “ACMI only thinks it’s important because it’s local” justification for discounting those feelings does not apply. I am now once again in the last year of a degree, finishing my doctoral dissertation. 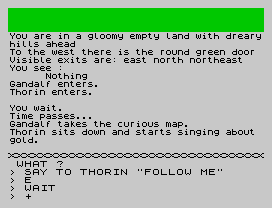 I hope that the research I’ve spent the last few years doing, and which I believe to be every bit as innovative as The Hobbit, will be found in another 30 years to have had the same worldwide impact as my “first crazy experiment in emergent text-adventure storytelling”. Thanks Veronika for sharing your personal experience and memories in this project, it’s pretty awesome to find out how many people’s lives you guys altered with your work. You’re a nice and humble human being. This was an excellent read!